Frances (Fran) L. White, Ph.D.
On February 26, 2019, at its regularly scheduled Board meeting, the Board of Trustees of Peralta Community College District (PCCD) named Frances (Fran) L. White, PhD. as acting chancellor of the District, replacing retiring Chancellor Jowel C. Laguerre. PCCD’s first female chancellor has deep ties to the District, as well as with each of the colleges. Chancellor White comes to the Peralta Colleges with nearly four decades of experience in higher education and a long history with the California Community Colleges in a variety of roles, including serving as interim president at both Berkeley City College and College of Alameda in 2016. She was also superintendent/president of the Marin Community College District for six years, retiring in 2010. Prior to that, Chancellor White was the president of Skyline College in San Bruno, Calif., the executive vice chancellor at City College of San Francisco, and the interim chancellor of the San Jose/Evergreen Community College District. She also served as assistant dean of communication, arts and physical education at Laney College, where she was a faculty member for several years. Chancellor White has a doctorate in education administration from the University of California at Berkeley, as well as a master’s degree in counseling psychology and a bachelor’s degree in psychology from the California State University, East Bay. She is a community college graduate and earned an associate degree in general education from Merritt College. Chancellor White has served on numerous local, state and national boards, commissions and committees. She is the statewide recipient of the 2010 Harry J. Buttimer Distinguished Administrator Award in the California Community Colleges. Chancellor White was named “Women in Business: Education Leader of 2009” for the North Bay Business Journal. She is a former member and president of the Association of California Community College Administrators (ACCCA). She is a past president of the American Association of Community Colleges (AACC) President’s Academy and served as a member of the President’s Academy Executive Committee for four years. She was appointed to the American Association of Community Colleges (AACC) Board of Directors for a term of three years. 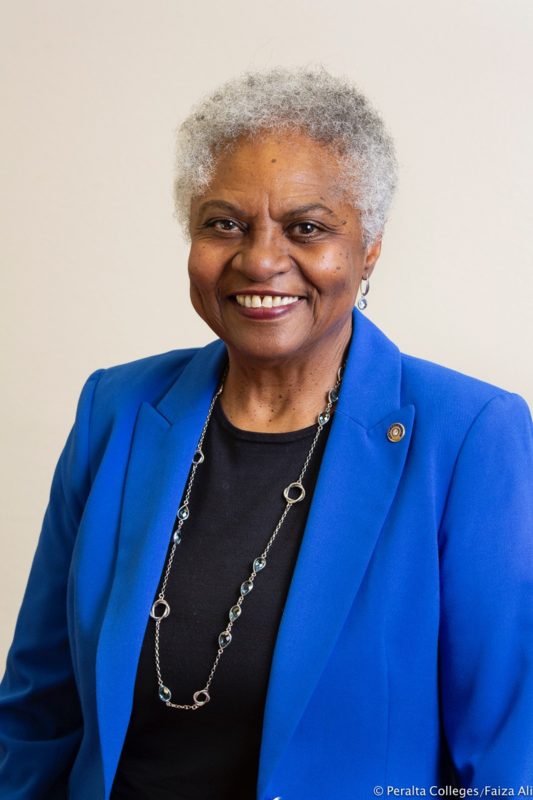 Dr. White is a former member, Commission of American Council on Education (ACE), Office of Women in Higher Education; and a previous member of the American Association of Women in Community Colleges (AAWCC). “I’m thrilled the District has an exceptionally qualified woman to take the helm and address day-to-day operations on an interim basis. The Board and our stakeholders can now focus on implementing a national search for a permanent chancellor consistent with our shared governance selection process in a manner that engages the public and the community.“ — Julina Bonilla, president, Peralta Community College District Board of Trustees.